A new animal study looked at pregnancy loss, including stillbirth, after infection with the virus. 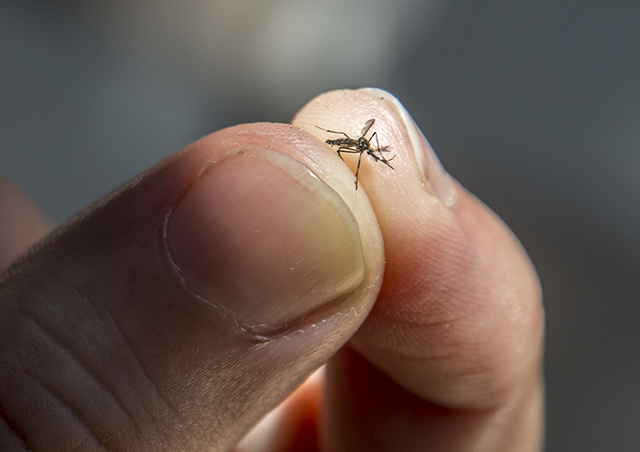 The bite of a small mosquito is the primary way the Zika virus is spread, but it can also be passed from a mother to her fetus. The lead author of the multi-institutional study was Dawn Dudley, senior scientist in the Department of Pathology and Laboratory Medicine, University of Wisconsin-Madison. Her collaborators from the University of Washington School of Medicine in Seattle were Kristina Adams Waldorf, professor of obstetrics and gynecology; Michael Gale Jr., professor of immunology; and Lakshmi Rajagopal, associate professor of pediatrics. Charlotte Hotchkiss, a veterinarian at the Washington National Primate Research Center, was also a co-author. The report on the study,"Miscarriage and stillbirth following maternal Zika virus infection in nonhuman primates," was published today in Nature Medicine. The Zika virus is spread primarily through the bite of an infected mosquito, but also from the mother to the fetus during pregnancy, and through sexual contact. In 2014, a large outbreak of Zika virus infections in Brazil spread rapidly through South and Central America, the Caribbean and Mexico. Hundreds of thousands of cases were reported. Local transmission was detected in 2016 and 2017 in Texas, Florida, Puerto Rico and the U.S. Virgin Islands. Symptoms of infection include rash, conjunctivitis, headache, and joint and muscle pain. These symptoms tend to be mild and in many cases the infection causes no symptoms at all. However thousands of pregnant women who became infected gave birth to children with severe neurological damage, abnormally small heads, eye and limb malformations and other disorders, collectively known as the Congenital Zika Syndrome. A rapid scientific response to address this global threat led to development of animal models of Zika virus infection to understand the spread of disease and to test vaccines. Scientists began to notice an unexpected number of stillbirths after an experimental infection with the Zika virus. Dudley and other University of Wisconsin scientists aggregated data from six National Primate Research Centers to understand whether Zika virus infection might cause miscarriage and stillbirth. They found that, following Zika virus infection of the mother, the fetus died in 13 of 50 animals studied (26 percent). This was significantly higher than the 4 percent to 11 percent rates of miscarriage and stillbirth among uninfected animals housed in the primate centers. “Most importantly, the timing of many stillbirths in the last half of pregnancy was unusual, compared to normal rates in late pregnancy, suggesting that Zika virus infections indeed caused the fetal deaths,” said Hotchkiss. Progress in preventing stillbirth has lagged other improvements in maternal and child health. Stillbirth has been historically difficult to research due to inconsistent reporting, grief and stigma for affected families and differing definitions of miscarriage and stillbirth around the world. “This research shows that Zika virus must now join the ranks of malaria and syphilis as a preventable infectious cause of stillbirth. Reducing the number of preventable stillbirths in the world will mean that we must prevent Zika virus infections in pregnant women. We must continue to send the public health message that women and their sexual partners should avoid travel to areas with local mosquito transmission of Zika virus during pregnancy and prior to conception,” said Adams Waldorf. In 2016, Brazil saw a 5 percent drop in birth rates; birth rates dropped 10 percent in Pernambuco, a state in northeastern Brazil that had particularly high infection rates during the Zika virus outbreak. Researchers are concerned that Zika infection-caused miscarriages and stillbirths might explain part of this birth-rate decline, as well as conscious choices among some women to avoid pregnancy. “We are learning that a Zika virus infection can be deadly for the fetus in any pregnancy and there is still an urgent need to develop an effective vaccine,” said Rajagopal, who studies newborn infectious diseases for Seattle Children’s Research Institute.